4 to 6 inches of powdery snow fell in the Morris/Somerset region overnight – a modest event. However, the Saturday morning forecast calls for the temperature to be -2 degrees Fahrenheit at dawn. This snow and ice is not going anywhere right now. The Great Swamp NWR proved to be a pleasant ride during the day. One could bird from their car during the blustery frigid afternoon (temperature in the teens (Fahrenheit) with a cutting wind). A few minutes outside of the car to take in the snowy terrain and blue-sky scenery was as close to experiencing hypothermia as one would like. 150 Snow Geese were flyovers in Chatham Township; a Common Raven was observed in Myersville; a Red-shouldered Hawk was seen at the overlook at Pleasant Plains Rd., Great Swamp NWR (Simon Lane). An adult male Northern Harrier (“Gray Ghost”) was hunting the marsh at the end of Woodland Road, Great Swamp NWR (J. Klizas). 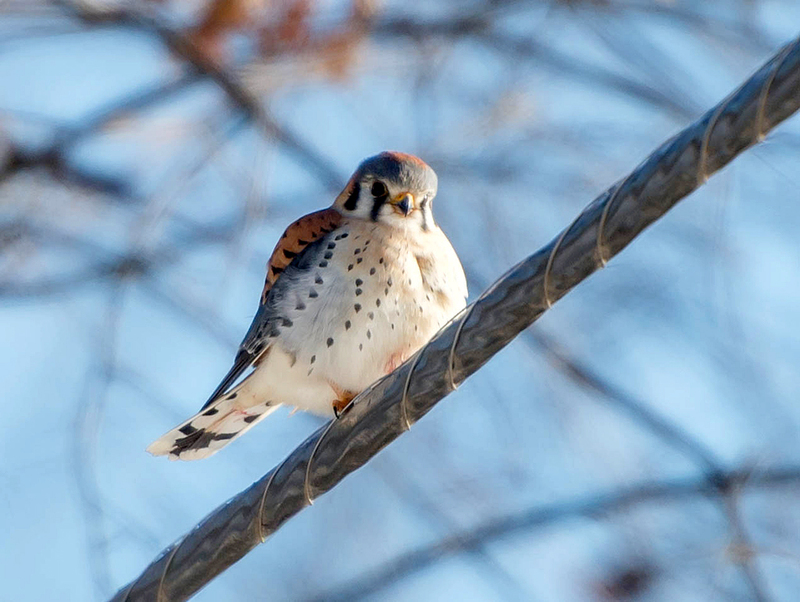 Chuck Hantis photographed a chilled American Kestrel and an American Tree Sparrow at the Great Swamp NWR today. American Kestrel, Great Swamp NWR, Jan. 3, 2014 (photo by Chuck Hantis). American Tree Sparrow, Great Swamp NWR, NJ, Jan. 3, 2014 (photo by Chuck Hantis). The leucistic Dark-eyed Junco below was photographed at a feeder in Gillette, Long Hill Township. Thanks to Joyce and Robert Stapperfenne for sharing the photo. Leucistic Dark-eyed Junco, Gillette, NJ, Jan. 3, 2014 (photo by Joyce and Robert Stapperfenne). Bernardsville Quarry (Old Quarry Rd.) had 300+ Canada Geese, 9 Gadwall, 26 Am. Black Ducks, 92 Mallards, 4 Northern Pintail, 3 Ring-necked Ducks, 1 Bufflehead, 1 Ruddy Duck and 2 Common Ravens (Jeff Ellerbusch).